The City Paper has the final word on the Watergate: Sold this morning for $25 million to PB Capital, who are creditors to the current owners of the property. There was just the one bid, despite some commotion and some phone calls. Who knows what PB Capital will do with the closed hotel. Perhaps turn it into a corruption-based theme park, with a hall of horrors featuring Richard Nixon and Duke Cunningham? 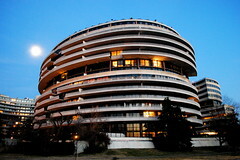 Actually the AP and WJLA are saying that there were no bidders on the Watergate property!